First impressions are important! 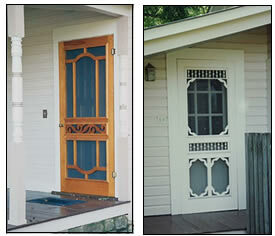 Your Vintage Woodworks Screen & Storm Doors welcome you and your friends with charm and elegance. They acknowledge your good taste, while reminding others that you value the traditional but also demand quality and energy efficiency in a Screen & Storm Door. Our Lifetime, Solid Wood Screen & Storm Doors provide a beautiful way to be practical all year long! Nothing compares to gentle breezes wafting through your home... and savings on air conditioning bills are assured. For Fall and Winter, optional Storm Panels convert Screen Doors into great looking Storm Doors, with extra comfort for you and your family! We handcraft each Door, including many quality features for at least a lifetime of use and enjoyment! Our custom sizes, custom design possibilities, choice of woods, shop-direct prices, prompt shipment, and small-town service are all guaranteed to please! The photo at left show Screen Door 7102 on a log home. Not only is this Door very inviting, but it lets the cool breezes inside. All our Doors can be used in either Screen or optional Storm mode. But there is a third way to use a Vintage door... Order your Door with only our optional tempered safety glass storm panels and use it as a unique Interior Glass Door! Hanging such Doors inside your home or business creates the special elegance only a glass Door can bestow, as they admit light between rooms with a grace and charm that�s difficult to achieve any other way. There's a subtle refinement to any room fortunate enough to have glass Doors, and your good taste will be recognized by all who visit! Door 7143 on the right makes a great entrance into this office. Additionally, any of our Doors can be installed as Double Doors. T-Astragal Moulding is used to hide the space between Double Doors. 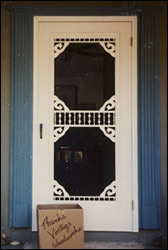 If requested, we will include T-Astragal at no additional charge with your order for two or more Screen and Storm Doors. At left, a pair of Door 7117 installed as Double Doors works well on this home. Our standard designs are only the tip of the proverbial iceberg! Perhaps you favor the top section of one Door, but the bottom section from another? No problem! We'll just combine these sections with the middle design of your choice to create your own �dream door.� You can add, omit, or change the details of the designs we show, or start from "scratch" with your own ideas. Either way, we�re eager to produce a special Door just for you! Call us at 903-356-2158, and we'll talk it over. Our customer who ordered the custom Door shown at right above started with Plain Door 7123 and had us add top and bottom Gallery Rails, a middle 6-3/8'' Ball & Spindle Spandrel #4126, and eight Screen Door Corner Brackets. We have Vintage Woodworks Screen & Storm Doors on the front and back of our own house, as pictured at the left. Returning home, greeted by our Doors, we�re reminded of words from an earlier Vintage Woodworks catalog... �as shall be most pleasant to the eye and uplifting to the spirit.� We heartily agree, and wonder how we ever managed in spring and summer without the fresh air they now provide. To hear little birds singing and smell the freshness of a spring morning... that�s almost heaven! Front Door (far left) is Door 7110. Back Door is Door 7102. Click for Features, Options, Ordering Info, Etc.